Visiting Senior Research Fellow, Institute of Southeast Asian Studies (ISEAS), Singapore, Senior Fellow, MFA Diplomatic Academy, Singapore, Adjunct Professor at Singapore Management University (SMU), Adjunct Professor at Copenhagen Business School (CBS). JUST IN. MY NEW BOOK `EUROPEAN INTEGRATION - SHARING OF EXPERIENCES´. PUBLISHED BY ISEAS. For flyer Click. 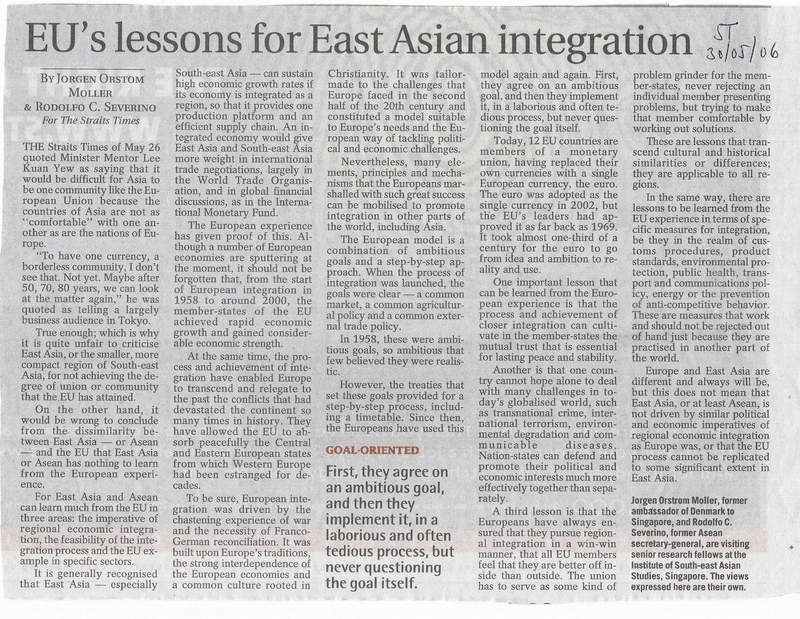 Reviewed by former ASEAN Secretary-General, Mr. Ong Keng Yong, The Straits Times for 11 June, 2008. Today is the first day in the rest of your life. Use it properly and wisely! 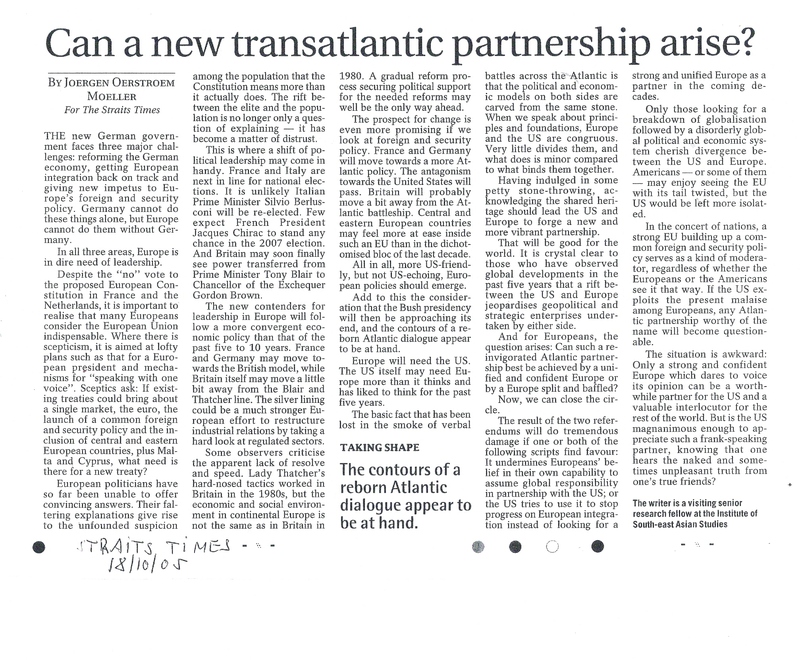 A) Latest comment in International Herald Tribune. 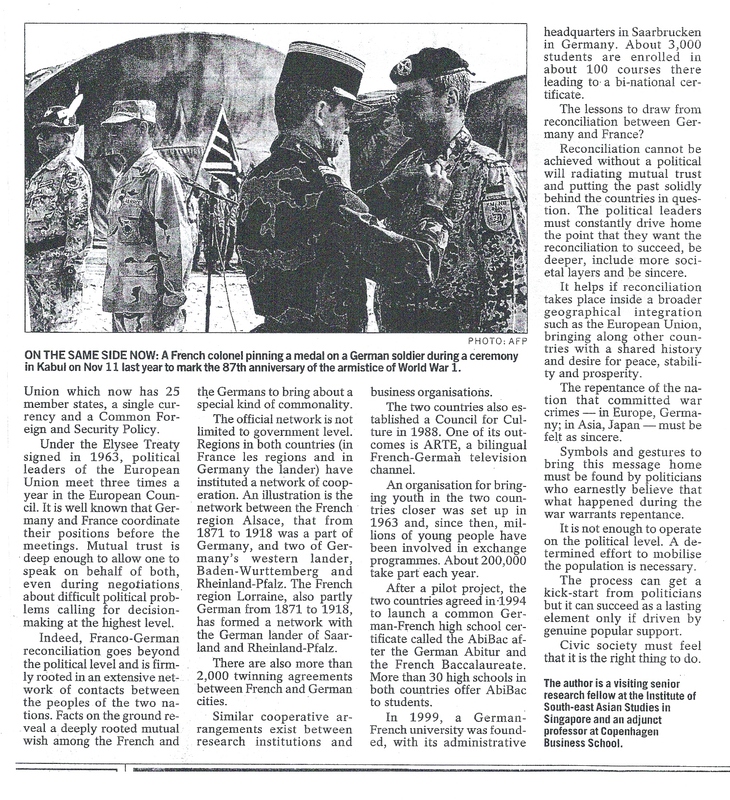 2) August 25, 2007 (letter), Heed the warning, Click or link http://www.iht.com/articles/2007/08/24/opinion/edlet25.php. B) Latest Comments in the Straits Times. 15. June 22, 2007 about shift in global economy and Southeast Asia (This is SE Asias´s moment). Click. 8.June 6, 2006 about Far too early to call for obituaries (about EU!) Click - Click. 4. 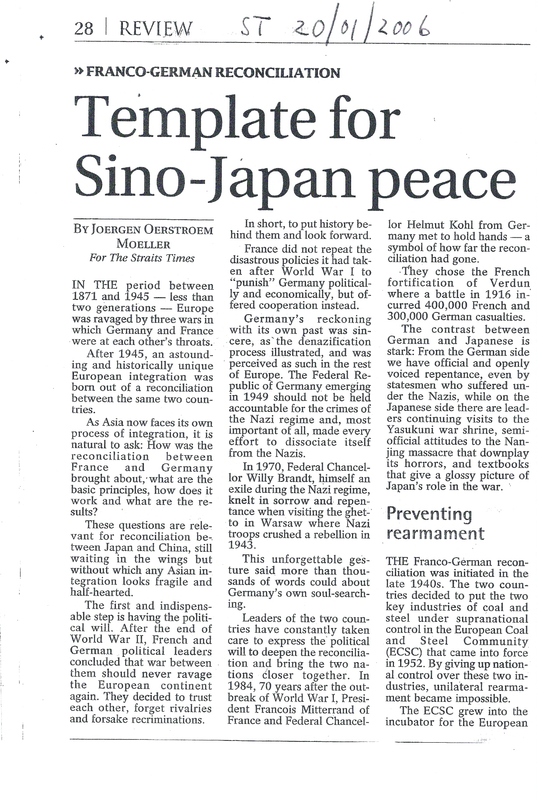 January 20, 2006 about Template for Sino-Japan peace. Click - Click. 1. 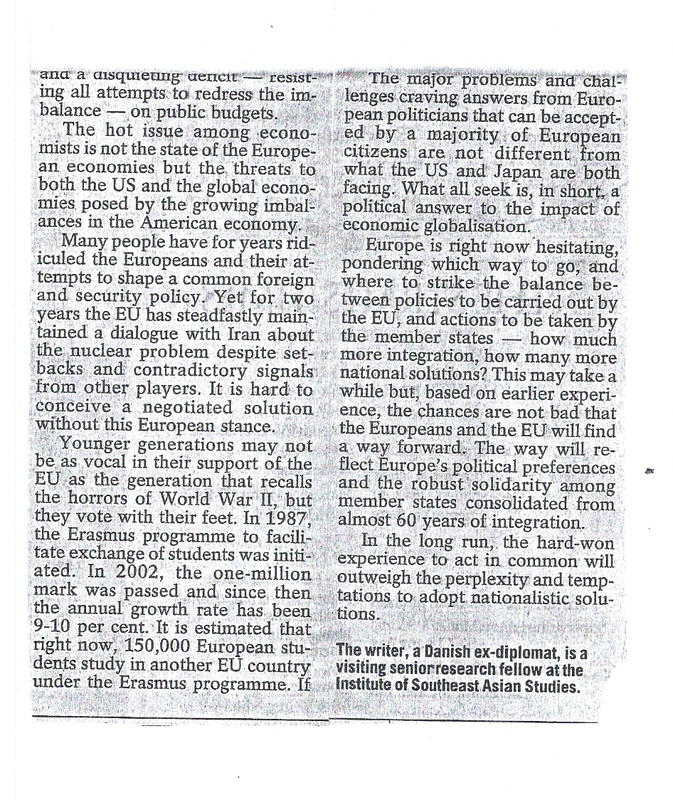 October 4, 2005 about the role of EU in Southeast Asia. Click. 3. October 23, 2008, How to save the financial world, Click or http://www.businesstimes.com.sg/sub/views/story/0,4574,302405,00.html? 1. November 4, 2005 about The Nordic Model Click. 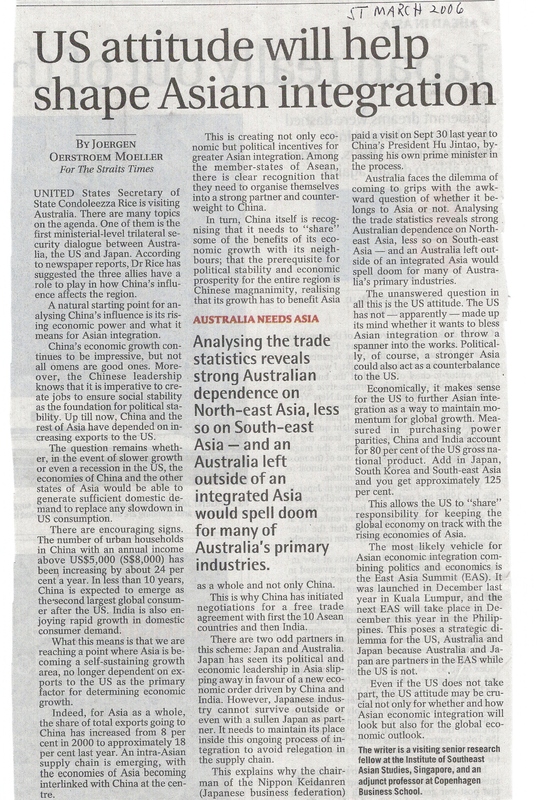 D) Latest comment in China Daily 12-13 December 2006 quoted in last three paragraphs on US-China Strategic Economic dialogue. Click. E) Latest comment in Yale Global online. F) Latest comment in `The National Interest online`. 3. June 6, 2007. The Holy Grail of Central Banking. Click or http://www.nationalinterest.org/Article.aspx?id=14568. 1. 27 October 2006, The New Media Inc, with Terence Chong Click or http://www.nationalinterest.org/Article.aspx?id=12720. G) Latest comment in Asia Times on line. 7. January 10, 2008, Asia to follow serfin` USA? Click or http://www.atimes.com/atimes/Global_Economy/JA10Dj01.html. 6. November 13, 2007, Asia has a model in the EURO, Click or http://www.atimes.com/atimes/Asian_Economy/IK13Dk01.html. 5. August 7, 2007, Unconventional wisdom on exchange rates, Click or http://www.atimes.com/atimes/Asian_Economy/IH07Dk01.html. 4. July 18, 2007, Financial storm ahead. Click or http://www.atimes.com/atimes/Global_Economy/IG18Dj01.html. 3. March 8, 2007, Whispers in the Wind, Click or http://www.atimes.com/atimes/China/IC09Ad03.html. 2. November 29, 2006, Growth in Asia propels US stocks. http://www.atimes.com/atimes/Global_Economy/HK29Dj01.html or Click. H) Latest comments in Opinion Asia. 12. WTO Negotiations Crash: what Now? August 5, 2008. Click or http://www.opinionasia.org/WTONegotiationsCrash. 9. Another looming crisis: A Whistle-blower in Centro? December 26, 2007. Click or http://www.opinionasia.org/Anotherloomingcrisis. 8. Post-Bali and Post-Kyoto: Who shall pay for Climate Change? 3. December 2007. Click or http://www.opinionasia.org/WhoshallpayforClimateChange. Reposted in Today for December 4, 2007. 7. Recovering from the Sub-Prime Debacle: The Coming Crisis, 9. October 2007. Click or http://www.opinionasia.org/TheComingCrisis. 6. Markets in Disarray? Don't sweat over the fever, cure the patient. Click or http://www.opinionasia.org/MarkertsinDisarray. Reposted in TODAY for September 3, 2007 link http://www.todayonline.com/articles/209000.asp. 5. Saying No! Foreigners and the Birth Pangs of New Protectionism about investment of sovereign funds. 26 July 2007. Click or website http://www.opinionasia.org/ForeignersandtheBirthPangsofNewProtectionism. 4. The New Capitalism: Lessons for Asia. 10 June 2007. Click or website http://www.opinionasia.org/TheNewCapitalism. 2. Asia and the Global Economy. 24 November 2006. 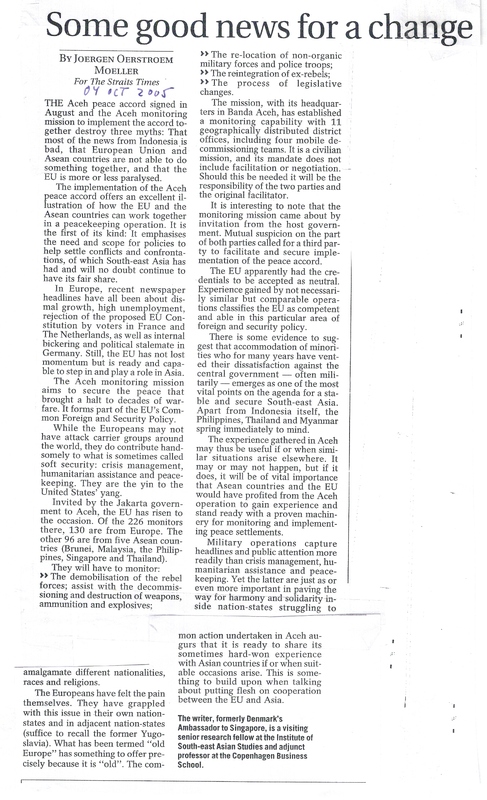 Click or website http://www.opinionasia.org/AsiaandtheGlobalEconomy.Also printed in Brunei times of 27 November 2006. 1. New Economics favour China and India. Website http://www.opinionasia.org/NewEconomicsFavourChinaandIndia. I) Latest comment in TODAY. 2) The Resilience of the European Union, June 20, 2008. Click or http://www.todayonline.com/articles/260609.asp. 1) Dutch Way, Muslim Way, April 19, 2008. Click or http://www.todayonline.com/articles/249218.asp. J) latest comment in South China Morning Post. 1) 28 March 2008. Rise and demise. Reposting of article from YaleGlobal online (27 February 2008). http://www.scmp.com/portal/site/SCMP/menuitem.2af62ecb329d3d7733492d9253a0a0a0/?vgnextoid=97be8e94350f8110VgnVCM100000360a0a0aRCRD&ss=China&s=News. K) Latest comment in The Futurist, Nov-Dec 2006. Click. 1) Eight Daisaku Ikeda Annual Lecture. 29 June 2008. Topic: Securing Peace in Asia for the Next 25 years. Click. 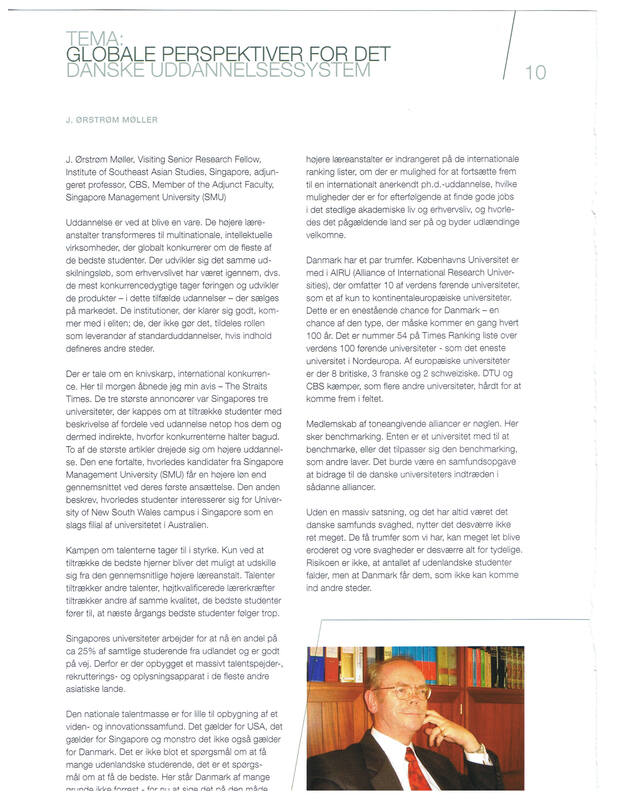 2) My contribution ´Fight Terror from the Moral High Ground` published in ´New Thinking on Peace´ by SOKA, Singapore 2007. Click. 27) Nanyang Technological University. Paper submitted to ‘Interdisciplinary Studies on happiness workshop II’ 20 – 21 November 2008, organized by the Centre for Liberal Arts and Social Sciences (CLASS) at the Nanyang Technological University (NTU). Topic: Happiness as a driver for creativity and growth: The example of Denmark. Click. 24) Symposium organised 3 july by ASEF on the book ‘ The New Asian Hemisphere’, by Prof. Kishore Mahbubani. Intervention on ´The importance of global institutions in mediating between the West and Asia´. Click. 23) Lecture at Rajaratnam School of International Studies (RSIS), NTU, Singapore, April 10, 2008. Click. 22) Presentation at Norwegian Business association, Singapore, 21 February 2008. Topic: future perspectives for Asia. Click. 21) Guest lecture, 20 February 2008, National University of Singapore. Political Science. Topic: basic elements of the European Union. Click. 17 Lecture October 12, 2007 at National Chengchi University, Basic Principles of the European Union and its Role in the World, Click. 16) Lecture October 11, 2007, Chung-Hua institution for Economic Research, Globalization in an Asian-European Perspective, Click. 15) Lecture October 11, European Chamber of Commerce Taipei, Globalization in an Asian-European Perspective, Click. 14) Lecture September 24, 2007 at University of Copenhagen, Series "Europe as a Challenge - Challenges to Europe", topic: " China, Japan and India as Challenges to the European Welfare State", Click. 12) Presentation at Workshop organized by Economic Growth Centre and Division of Economics, School of Humanities and Social Science, Nanyang Technological University, Singapore: Regulatory Impact Assessment and Decision Analysis and Effective Policy Making. June 2006. Topic: Economic Integration and FTAs. Click. 11) Lecture at Copenhagen Business School, May 17, 2006. Topic: Global Transition of Power. Click. 7) Presentations delivered at a seminar November 9, November 30, 2005 and February 8, 2006 arranged in Singapore by Danish industry in collaboration with Insead, Singapore. Topic: Economic outlook, Strategy and Tactic for enterprises on the Asian Market. Part One Click. Part two Click. l) Verdens økonomiske magtbalance tipper mod øst, Information 18. September 2008. http://www.information.dk/166031. k) Verden er på vej mod brutal konfrontation, Information, 13. maj 2008. Click eller http://www.information.dk/159113. j) Kina på spring, Investor, Marts 2008. Click. i) Kan international transport gøres bæredygtig? djoefbladet nr 4, 2008. Click eller http://www.djoef.dk/online/view_artikel?ID=14743&attr_folder=F. 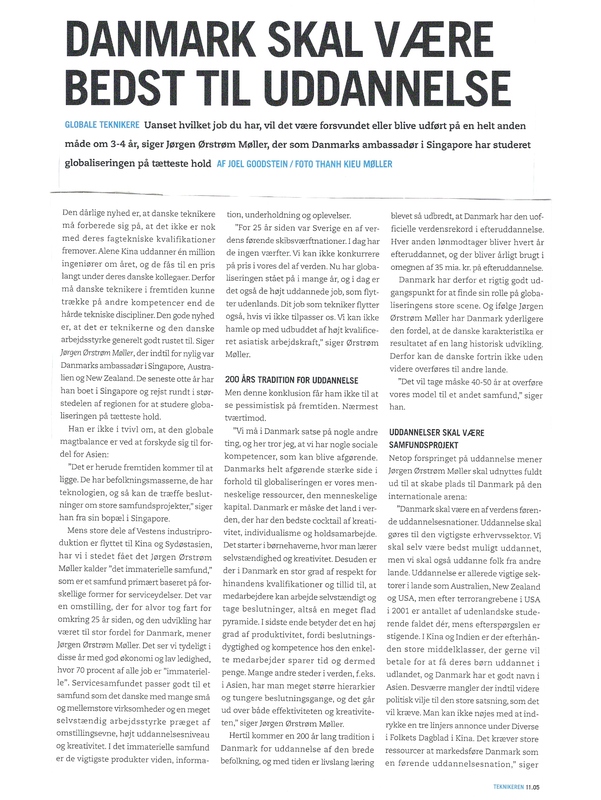 e) Interview i Teknikeren 11 05: ´Danmark skal være bedst til uddannelse´. Side 1 Click. Side 2 Click. 2) Præsentationer, indlæg, foredrag, artikler mv. r) Præsentation for gruppe under institut for Ledelse `Den Globale Udfordring´ den 9. maj 2007. Click. 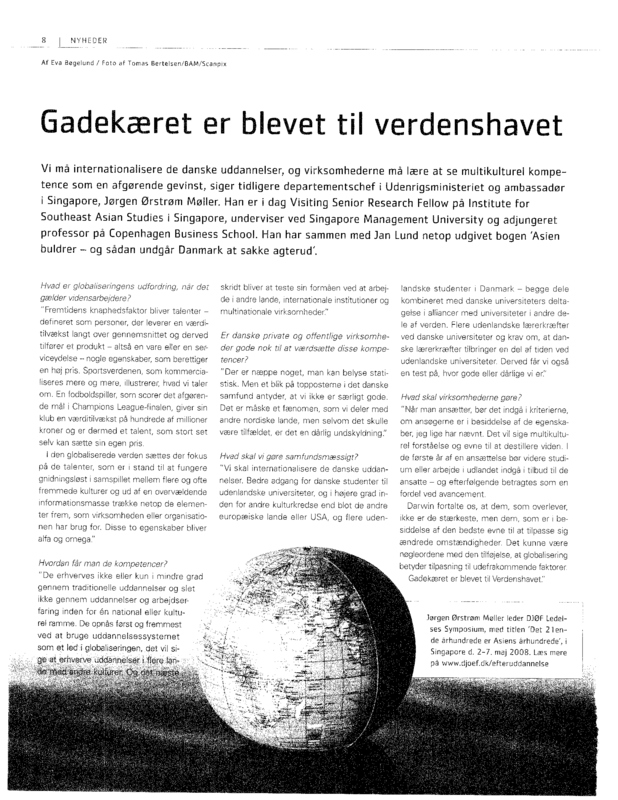 q) Præsentation for gruppe af danske embedsmænd om `Globalisering med fokus på Asien`, den 21. marts 2007. Click. 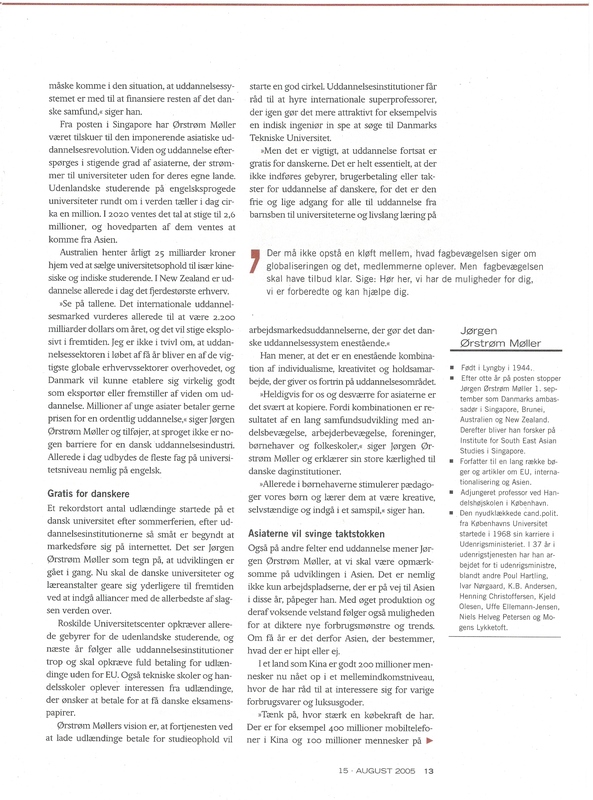 m) Præsentation om `EU tænkepause´ for Den Konservative Folketingsgruppe den 17. maj 2006. Click. - Politiken 27. December 2007. Kronik. Partnerskab med Asian. Sammen med Paul Hegedahl. Click. - Bidrag til FUHU`s årsskrift med titel `Globale Perspektiver for det Danske Uddannelsessystem`. April 2007. Click. - Politiken 25. Juni 2007 om ny kapitalisme og fonde. Click. o1) Januar 5, 2009, Fra lokal til global meningsdannelse. n1) December 8, 2008, Økonomisk krise truer global sikkerhed. m1) November 3, 2008, Tre nødvendige topmøderesultater. l1) September 22, 2008, Krisen forgår, konsekvenserne består. k1) September 15, 2008, Russisk magtdemonstration blotter hullet dansk forsvarsstrategi. j1) August 18, 2008, Irans atomvåbenambitioner kræver barske modtræk. i1) August 11, 2008, Klimakampens skjulte dagsordener. h1) Juni 30, 2008, Olieprisens oversete konsekvenser. g1) Juni 15, 2008, Protektionisme med omvendt fortegn. f1) Maj 19, 2008, Asiens demografiske udfordring. e1) Maj 5, 2008, NATO mangler et formål. d1) April 21, 2008, Verden efter subprimekrisen. c1) Marts 25, 2008, Ny populisme sætter internationale institutioner under pres. b1) Februar 11, 2008, Fra markedsøkonomi til leasingøkonomi. a1)Januar 28, 2008, Asien køber op i USA. z) December 10, 2007, Virksomhedsledelse i det autoritetsløse samfund. y) November 19, 2007, Den næste finansielle krise. x) September 10, 2007, Stigende fødevarepriser. w) August 27, 2007, Ny finanskrise truer. v) August 20, 2007, Voksende forståelseskløft mellem EU og Rusland. u) August 6, 2007, Ny protektionisme truer den økonomiske globalisering. t) Maj 28, 2007, De globale institutioners afmagt. s) Maj 21, 2007, Trendskifte i den global økonomi. r) April 16, 2007, Står den globale kapitalisme for fald? q) Marts 26, 2007, Klimaændring udløser global fordelingskamp. p) Februar 19, 2007, Den Glemte krig. o) Januar 8, 2007, Svækket USA truer den globale vækst. m) November 6, 2006, Atompolitik i ruiner om Nordkorea og ikke-spredning af atomvåben. 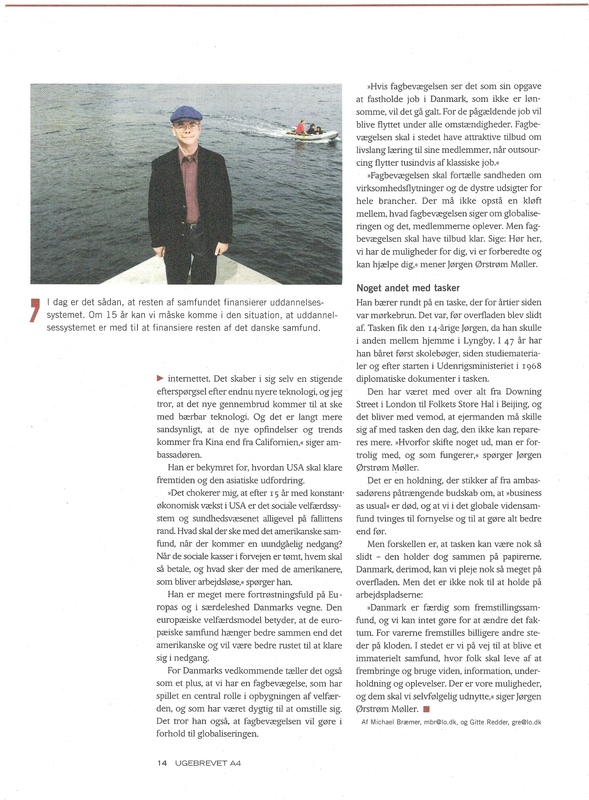 k) August 21, 2006, Magt og afmagt om begrænsningerne i brug af magt i international politik og økonomi. j) August 7, 2006, Økonomisk afmatning kan udvikle sig til global recession. i) Juni 19, 2006, Magtskifte i energiforbruget skaber nye økonomiske alliancer. h) Juni 12, 2006, En ny lære om magtens deling. g) Maj 15, 2006, Kina har succes med ny globaliseringsstrategi. f) Maj 8, 2006, Iran viser det internationale systems afmagt. e) April 3, 2006, Ny protektionisme og nationalisme truer globaliseringen. d) Marts 13, 2006, Muhammad-tegninger svækker Mellemøstens moderate muslimer. c) Februar 13, 2006, Om cartoon sagen - mediernes moralske og politiske ansvar. b) Januar 23, 2006, Global værdibaseret ledelse. a)Januar 16, 2006. Universiteternes rolle. - November 21, 2005. Fugleinfluenza truer globaliseringen. - Oktober 17, 2005. Den grænseløse virksomhed. - August 29, 2005 Japans økonomi og udsigter til reform. - June 27, 2005 Alle advarselslamper blinker. Verdensøkonomien bevæger sig hen i mod et omfattende økonomisk tilbageslag/krise. Der er mange tegn på en udvikling svarende til opløbet forud for 1929 krakket. 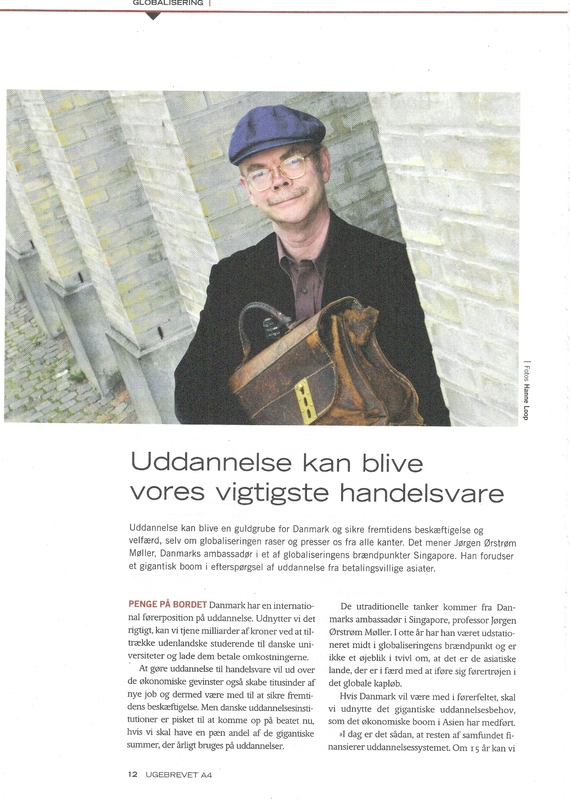 B) Latest article in Aktionæren. Januar 2009: Verdensøkonomien set fra Asien. 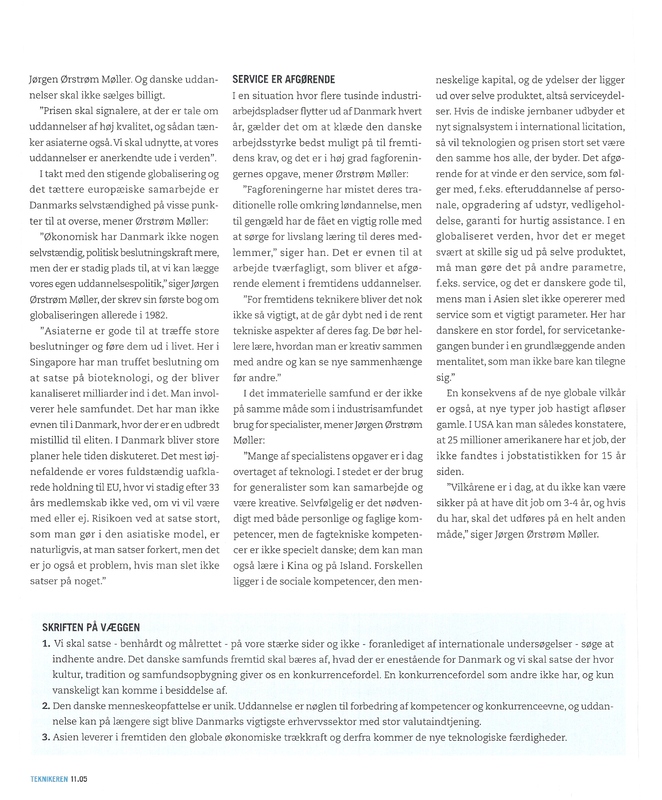 E) For those interested in history read my article originally printed in Politiken December 29, 1982 about 'Industrisamfundet i opbrud' Click or use Systime 'Verdenshistorien i dansk perspektiv' via www.systim.dk with sources. When the going gets tough, the tough gets going. So don't shy away from your personal rendezvous with future trends. Meet it head on! Put on your helmet, goggles, umbrella and charge into the unknown wilderness being the future. That will open your eyes. Then you will not be confused at a higher level but much the wiser. Will you fear the future or will you enjoy it? The choice is yours. Joergen Oerstroem Moeller has published 36 books since 1969 on political and economical issues ranging from the European Union to Southeast Asia. In addition, Mr. Moeller has contributed to 18 publications and been published in The American Interest, Contemporary Southeast Asia, Futures Quarterly, The Futurist, The International Economy, Business Horizons, and many many more. Newspapers: International Herald Tribune, The Straits Times, The Business Times and many more. Visiting Senior Research Fellow, Institute of Southeast Asian Studies (ISEAS), Singapore, Adjunct Professor, Copenhagen Businees School (CBS) & Singapore Management University, former Danish Ambassador to Singapore, Brunei Darussalam, Australia, and New Zealand.